Collins Booksellers - Basic Matrix Theory by Leonard E. Fuller, 9780486822624. Buy this book online. Written as a guide to using matrices as a mathematical tool, this text is geared toward physical and social scientists, engineers, economists, and others who require a model for procedure rather than an exposition of theory. Knowledge of elementary algebra is the only mathematical prerequisite. Detailed numerical examples illustrate the treatment's focus on computational methods. 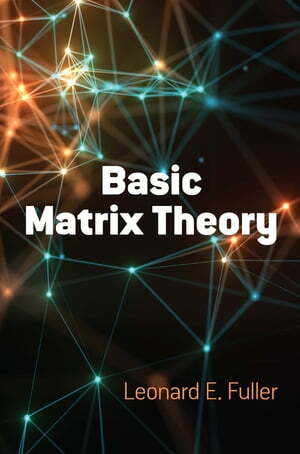 The first four chapters outline the basic concepts of matrix theory. Topics include the development of the concept of elementary operations and a systematic procedure for simplifying matrices as well as a method for evaluating the determinant of a given square matrix. Subsequent chapters explore important numerical procedures, including the process for approximating characteristic roots and vectors plus direct and iterative methods for inverting matrices and solving systems of equations. Solutions to the problems are included.